I am facing some problems and questions with facets. Back in the JSF UI and after the update, the fields get displayed in the view and edit layouts. However, when I edit the value, they don't get stored. This is the view layout after saving the document. The confirmation message tells me that saving was successful, and values that I enter in other fields get updated just fine. Only the fields of my InvoiceSchema don't get saved. but I don't see the fields that I defined for my InvoiceSchema (like Amount, InvoiceDate, RecordId) anywhere in the xml. Interestingly, if I don't use a facet that has my schema assigned, but add the schema directly to the File type, the problem does not exist and the values get saved. Looks like a bug to me?! Unfortunately I don't have a Jira account yet in order to submit it. thanks for your reply. I understood the explanation you gave above about the registry as well as the xml extension points. Not sure though where I am supposed to define the schema itself (in my case, the 'InvoiceSchema'). I tried it out and deployed that package. But still the properties don't get stored when I save the document. Looking at my package jar that I deployed, the xml extension and the schema including the properties are all included. Problem 2: How can I define view layout and edit layout for documents with certain facets? Let's say I have a facet that is not assigned to all documents (= not as described in problem 1), but only to some, for example when the facet gets assigned dynamically via an automation, and the facet has a schema with some additional property fields assigned. How can I show these fields in the view and edit layout based on whether the document has this facet or not? I cannot find this option in the Studio. In Studio, I can only define the view and edit layouts fixed for a certain document type, but I cannot give any conditions, such as 'if the document has facet x applied'. How to solve this? You did step #2. That means Studio will behave as if the facet exists in Nuxeo Platform, which is why everything works smoothly until you deploy your config. But as you are missing step #1, the facet doesn't actually exist in Nuxeo Platform! The reason Nuxeo Studio does not create the corresponding extension automatically when declaring a facet in the registries is because it could be contributed from somewhere else: another bundle or Studio project for instance. However, an improvement could be to better inform users and / or offer to do it => I'll create a ticket for that. In a layout, a widget's mode (edit, read only, hidden) can be changed depending on a custom condition. I may advise you to have a look at the documentation explaining how to control the display mode of a widget. The currentDocument variable relates to a DocumentModel object, so you can easily add further conditions and not only check for the facet. Hello Bertrand, thanks for your reply. (I will give it a try, once I resolved some other issues I am having with the update mechanism of Studio, but that's another thing.) I understood the explanation you gave above about the registry as well as the xml extension points. Not sure though where I am supposed to define the schema itself (in my case, the 'InvoiceSchema'). Did I do it right via "Studio > Content Model > Schemas" or should I register the schema via "Studio > Settings > Registries > Document Schemas", or both. 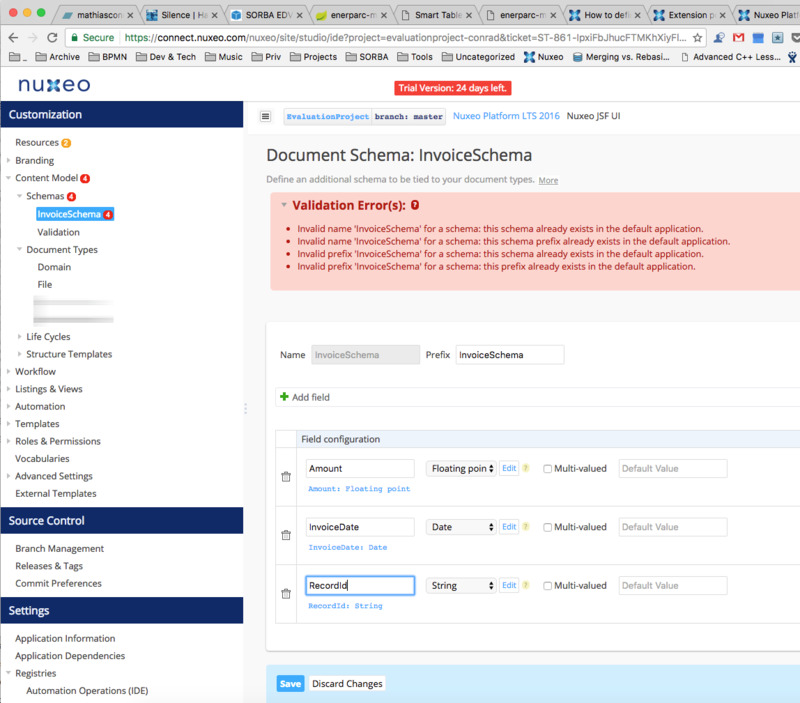 When I register the schema via the latter as well (additionally to having it defined under the Content Model > Schemas menu), then I get some validation errors like this: saying "Invalid name 'InvoiceSchema' for a schema: this schema already exists in the default application". Bertrand Chauvin I tried it with the xml extension for the facet, but it still does not save the properties. I updated my problem 1 above with a detailed descriptions and debugging information. I spawned a new Nuxeo docker container and the problem with the properties of my custom facet not being saved is gone. Basically using the same project configuration from the Studio. Maybe something was broken with the initial instance. Bertrand Chauvin Can the solution for problem #2 be achieved via Studio, or would the Studio then not work for this anymore? Setting the condition in Studio is easy, but the problem is that I did not find a way to select the field / facet property in the first place, if it's not statically assigned to the document type, which it isn't, since I am adding the facet dynamically via automation chain. I would like to add a string field to the 'File' document type layout, which should display the property InvoiceSchema:RecordId, where the InvoiceSchema is not always assigned to a File. 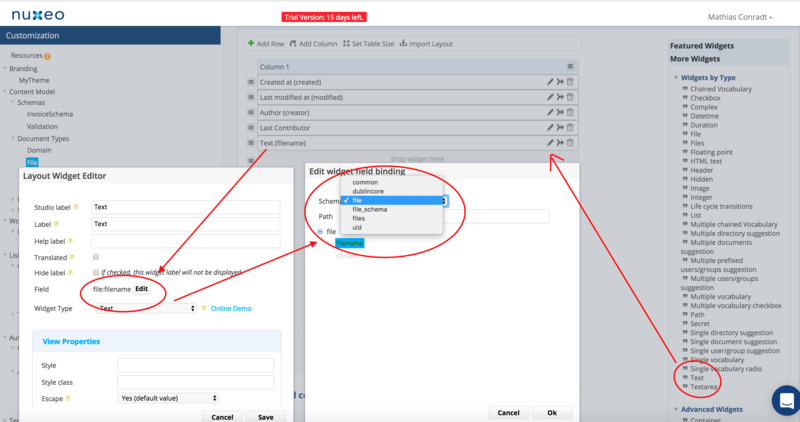 The InvoiceSchema is not available in the 'Edit widget field binding' dialog (unless I would assign the schema statically). I was looking for a widget where I could freely type the schema and path, and not having to select it from a dropdown. But also the "Text" widget only offers a dropdown. I guess I could adjust it in the xml source directly, but then I guess the rest of the Studio layout editor cannot be used anymore for the layout configuration of that file type?! Nevermind, "Generic" is the correct widget to use… got it working now. Thanks for your help.